The subject line says it all: Football season is upon us. The NFL’s preseason began last week, and college football kicks off Sept. 3. Go Seahawks! Go Beavers! Go Ducks! Go Whoever Your Team Is! 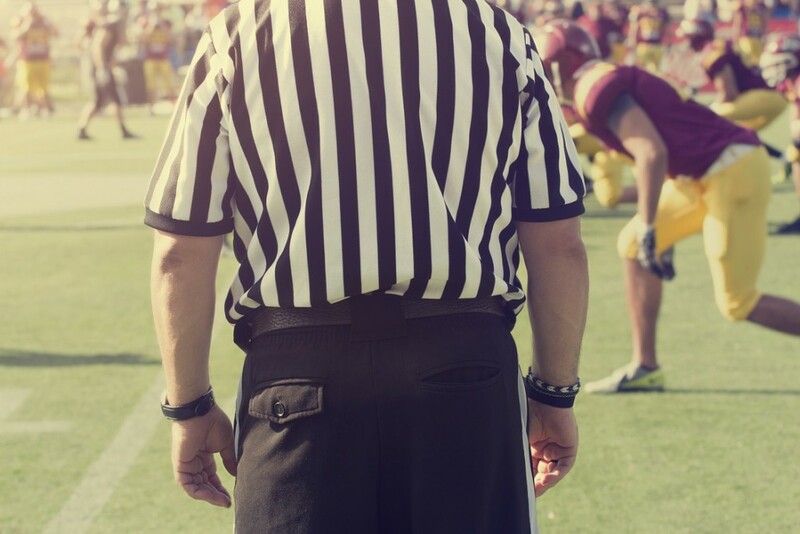 Among American sports fans, no other sport comes close to football in popularity. Last February’s Super Bowl XLIX stands as the country’s single most-watched television broadcast of all time, and last fall, 45 of the 50 most-watched TV shows were NFL games. What does it all mean? It means you probably want to watch football on TV this fall. So here’s a roundup of opportunities to do so for BendBroadband customers, including links to the networks’ TV Everywhere apps so you never have to miss a game! Sept. 4 — Weber State vs. Oregon State, 5 p.m.
Sept. 5 — Portland State vs. Washington State, 11 a.m.
Sept. 5 — Eastern Washington vs. Oregon, 5 p.m.
Sept. 19 — Georgia State at Oregon, 11 a.m.
Sept. 19 — San Jose State at Oregon State, 5 p.m.
— The Big 10 Network (26 / 626 HD / 2Go) will kick off its 40-game football slate on Sept. 4. The channel’s schedule of primetime games is here. Get BTN2Go. — Fox Sports’ 2015 college football schedule features lots of great matchups from the Pac-12, Big 12 and Conference USA. Read all about it here. Get Fox Sports Go. — For fans of the Southeastern Conference, CBS (6 / 606 HD) will have weekly conference games from Sept. 5 through Christmas; the full schedule is here. Meanwhile, you’ll be able to watch 45 live, exclusive football games on the SEC Network (48 / 648 HD / 2Go) this season, and the network has posted its plans for its the first four weeks of the season. Get SEC Network through Watch ESPN. — ROOT SPORTS (20 / 620 HD) will broadcast Big Sky Conference football weekly between Sept. 19 and Nov. 21, featuring Portland State University, Eastern Washington University, the University of Montana and more. The schedule is here. — As always, the NFL will be everywhere, with games broadcast on CBS, Fox, NBC, ESPN and more. The full schedule is here. Sunday Night Football will again run on NBC (6 / 605) for 18 weeks, with the Seahawks featured no fewer than three times. Check out the whole SNF schedule here. NFL Thursday Night Football returns to both CBS (6 / 606 HD) and the NFL Network (42 / 642 HD / 2Go) this year, kicking off Sept. 17 with the Denver Broncos taking on the Kansas City Chiefs. Both networks will carry games Sept. 17-Oct. 29, and the rest of the season will run on the NFL Network. You can find the whole schedule — including that tasty Seahawks vs. 49ers game on Oct. 22 — right over here. 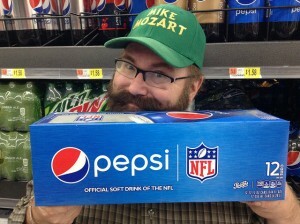 Here’s a picture of a guy holding a 12-pack of Pepsi adorned with the NFL logo. 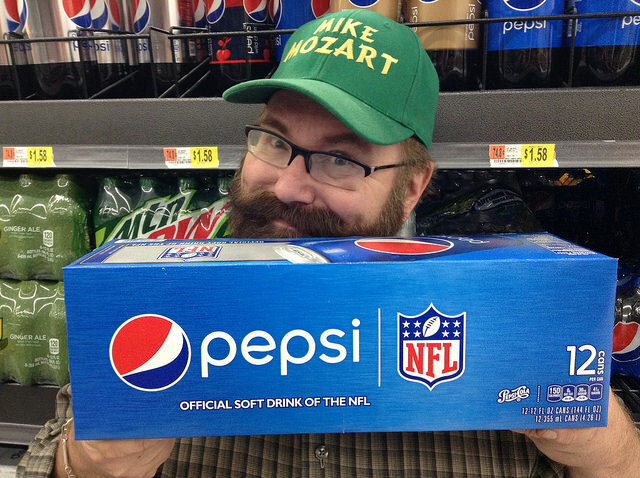 His name is Mike Mozart, and this is what he’s all about. Thanks, Mike! — You can catch every touchdown all on one channel with a subscription to NFL RedZone (557 HD), which takes fans from game to game to see the most exciting plays every Sunday afternoon. RedZone is available as part of our HD Plus package, which costs $8.99 and is only available with a subscription to the Preferred package. It’s also available anywhere via BendBroadband2go. For more information or to sign up, call us at 541-382-5551. Note: All customers can preview NFL RedZone during the NFL preseason and Week 1 of the regular season. That’s 7:30-11 p.m. Aug. 22; 7-11 p.m. Aug. 29 and Sept. 3 and the Sept. 13 weekend. — Finally, if local high school football is your game, we’ve got all the action live on COTV Sports. Find it in HD on Channel 611 and standard definition on Channel 11!